Your editor for Aldrington is Neal Ball. If you’ve got any queries about this area, or can add any information, photos or memories, please send My Brighton and Hove a message via the Comments form at the bottom of this page. Known these days (by estate agents at least) as ‘the popular New Church Road area’, ‘Portland Road area’ or ‘Poets’ Corner’, Aldrington is the part of Hove bounded by Sackville Road in the East, Boundary Road in the West and the railway in the North. It was said at one time that the River Adur once had its mouth in Aldrington, although these days there is no trace, with the river proper starting at Shoreham and heading in-land to Steyning. The area is now largely housing with a good many large houses built in the period from 1880 onwards. Little has changed over the years, although during the 1960s several of these were demolished to build rather uninspiring blocks of flats. The most recent construction was in the late 1980s when a group of properties owned by the landlord Nicholas Van Hoogstraten were compulsorily purchased and two blocks of social housing were built on Portland Road. This road in particular is full of what can only be described as ‘odd’ shops, with a good number offering second hand furniture. The Poets’ Corner area has roads such as Wordsworth Street and Livingstone Road, all very similar with Victorian properties dating from around the turn of the century. The halt at Aldrington is on the main-line from Brighton to Worthing and Southampton (the former LB&SCR route). Until December 1938 this was the junction station for services up to the Devil’s Dyke (indeed, it was called Dyke Junction). Today it presents a very bleak entrance to the suburb, with only two trains an hour stopping at this un-manned halt. Notable buildings within the area include a few churches, schools and a former cinema. The Granada on Portland Road was opened in July 1937 by Dame Anna Neagle, closing as a cinema in 1973 when it was converted to bingo. It is still trading today, although it is fair to say as a shadow of its former self. Our local pub, ‘The Aldrington‘, acknowledges the area’s one-time toll keeper and is at the end of our road – Westbourne Street. I was browsing around, feeling a bit nostalgic (I’m in British Columbia). I was born in Prinsep Rd in 1936, and remember the war years there well. Can anyone tell me when the neighbourhood became “Poet’s Corner”? Is this part of the machinations of the estate agents to up the prices? I realise the streets were named for poets, but I’ve had no luck in finding anything about Prinsep. Do you have any info on him? Is there truth to the the story that St. Barnabas Church is closing? Maybe photos of the church would be great to view on the site. I have many memories of the area I could recall, if anyone is interested. Kids were much freer to roam safely when I was small, and roam we did! Well, actually there is still a trace of the river Adur in Aldrington! Although “the river proper does now start (actually correctly the terminology is that the river finishes) at Shoreham” it once, many years ago, met the sea at Aldrington. The mouth was at the bottom of Hove Street. The trace of the old river bed can still be seen running parallel to the coast road and sea front, from the Lagoon towards the bottom of Hove Street. Quite clearly a dip in the land exists, where the Lagoon pitch and putt course, tennis courts, bowls greens and West End Cafe gardens are, is the bed of the old river Adur. The land on either side is much higher and these are the banks of the old river. I suspect that the mouth entrance at Hove Street was obstructed by the eastwards drift of shingle and the river broke through at Shoreham. Clearly the harbour and Lagoon were once part of the river. Connaught Road School – I have an ancestor who went to this school in 1907. Can anyone give me any history of the school and does the original building stand today? As a churchwarden at St Barnabas’ Hove, I can assure you that we are fighting hard to keep our church ‘up and running’. We believe in our future and hope to persuade ‘the powers that be’ that we are very much alive.Visit us in person and/or visit us on our website : http://www.achurchnearyou.co.uk. Follow instructions on the home page to go to St Barnabas. Includes a picture gallery. Regarding the question from Paul Lucas on Connaught Road School “does it still stand today”? Yes it does, let me know your email address and I’ll send you some photos! I was most saddened to hear that the Aldrington is to be no longer. This pub has existed for over 120 years. I was a frequent user and made many friends there. The place will be sorely missed by many. Has any one got any information as to what is to become of the pub? 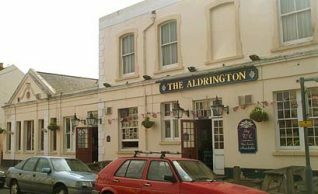 I have just come across the photo of The Aldrington pub and it brought back a few memories. One of nights out with girls and another I remember oh too well. A friend and I had been shopping in nearby George Street and had just left a friend who lived nearby when the heavens opened, so we decided to take shelter while waiting for our bus. We ordered our drinks – the barman took one look at us and said “I’ll serve her but not you.” We looked at each other and laughed. The barman was adamant and said again that he would not serve me but he would serve my friend. The truth was I was a “married lady” over 21 and with two sons and my friend was three years younger. I wonder if that would happen today? Could that barman tell the ages of any of young ones who entered his bar now? My late father Horace Hornby used to go to the pub when we lived in Westbourne Street. The last time we went into the pub with my wife Dawn, they had a quiz about history of the day. Sad to hear the dog home is closing. My dad called it a part of history, and I hope that someone can save it. We have recently discovered that my husband’s g.g.grandfather, Michael Maynard was the gate-keeper in Aldrington in 1841. His name is the only name on the 1841 census for Aldrington HO 107/1112/2. We were so interested to discover the Old Aldrington Pub Sign on your site showing a tollgate keeper with only one leg as we have recently discovered that Michael Maynard only had one leg!Michael Maynard was born at Cold Harbour, adjoining Plaw Hatch Gate in the parish of East Grinstead in 1809. In 1878 there was a report on the Ashdown Forrest Dispute and statements were taken by many of the residents living there at the time. These included a statement by Michael Maynard who had left Aldringham sometime between 1841 and 1851 and returned to live in the place of his birth (Cold Harbour in Ashdown Forrest). Part of his statement reads “I was born on the property and lived there till about 14 when I went to service on Cansiron Farm for about a year, then to Holyte with a Mr Gasson who had Courtlands Farm for 1 year. Then I went brickmaking in the summer and hoopshaving in the Winter for 3 or 4 years. During this time I went back and forwards to home. Then I had my leg off at Brighton Hospital from a cold caught brickmaking. Then went turnpike gate keeping and other occupations till I came home about 30 years ago”. Is it possible to find out if the name of Michael Maynard is given as Gate-Keeper in 1831. There is an element of mystery surrounding the marriage of Michael Maynard, if he is gate-keeper in 1831 is there a wife with him? You mentioned that there were two people on the 1831 Aldrington Census. How about the Old Inn itself? Was this built on the site of the old tollgate? When was it built? 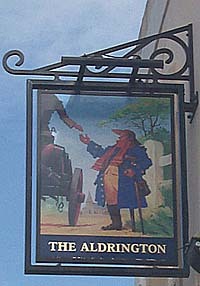 Does anyone know what happened to the Old Inn Sign showing the man with one leg? Is it in a Museum anywhere? If anyone can answer any of these questions we would be very grateful. Many thanks for such an interesting site. The Aldrington pub has now been refurbished and is called The Westbourne but the actual building still stands and IMHO. iI is a much nicer, friendlier pub now. Portland Road shops are still an odd mix but the are slowly getting a bit more gentrified which reflects the house prices in the area. If you are selling a flat in Central Brighton then “Poets’ Corner” (or as estates agents call it “the popular Poets’ Corner area”) is probably the nearest area in which you can afford to buy a whole house which makes the area very popular with young families which want to move into their own home with an outside space. Hello all, I am tracing my family and find that my Grandparents were married at the Congregational Church in Ventnor Villas, Hove in September 1908. Grandfather was a waiter at Dormans Park Hotel and Gran was a domestic servant in Langdale Gardens, Aldrington. The hotel is still there as is Langdale Gardens but I can find no record of the church. Is there a resource I could access for more information? Regarding Robert Smith’s query there is a street named Chelston Avenue which is a turning south off Portland Road Hove, not far from Portslade Station. Hope this helps. Does anybody have any information about a young child drowning in Aldrington Basin in 1915? I was born in 1966 and moved into Hallyburton Road at the age of 18 months, in the autumn of 1967, which is where I grew up. The property that was owned by Nicholas van Hoogestraten was called Portland Gate and it was built in the late 1940’s after a crashed aircraft destroyed the houses at the top of Portland Avenue, Woodhouse Road and Coleman Avenue, so an old neighbour of our’s who lived in Hallyburton Road during the war told us. However, the Old Peoples’ Home at the top of Coleman Avenue was built later on in the 1960’s. The flats in Ingram Crescent weren’t built until the late 1970’s and the last block to be built, which is Wish Court in Ingram Crescent West, wasn’t completed until the summer of 1982. Portland Gate was finally demolished along with the Old Peoples’ Home in the early 1990’s, being replaced by Mcnair Court (who, some say was the name of the pilot of the downed plane that crashed on the site – not sure about this though) and Noble Court. What I would like to know is what was the little green square that was surrounded by houses called that was where Stephen’s Court now stands. The Aldrington hotel (pub) is now called The Westbourne. Jane Elizabeth Thorpe drowned in Aldrington Basin on July 27th July 1915. She was seven. The coroner recorded it as accidental death. I had a psychic reading today, she “said” she was playing and didn’t realise she was in danger. If the medium is to be believed, she hit her head and fell. It was an accident. If anyone knows any more about this then I would love to know. Aldrington is a really underated area of Brighton, lots of history and definately a place in the city for the future. Fascinating reading, which I stumbled upon by accident! I was born in Hove in 1942 and we lived (safely) in Portland Gate flats up until about 1945 – so your contributor Neil Tideswell is wrong about it being bombed! Also my cousin and aunt (the Leas) and granny Glaum also lived there at the same time. My Mum (Alma nee Glaum) attended Aldrington High School until 1931 and used to live in Norton Road. I went to school at Westwoods, in Hove and cousin Richard Lea must have started at St Christopher’s PNEU (whatever that meant) around 1944/5! I learned to ride a 2 wheeler bike down Coleman Avenue and remember that area well. In reply to Neil Tideswell, Neil, I think you’ll find the little green surrounded by houses was Ingram Square. I used to live at the western end of Portland Road and go to school at Aldrington C of E. I’m sure I remember there was a bus stop between the two called ‘Ingram Square’, it was opposite the top of Portland Avenue I think. On the memory trail – I’ve started so I’ll finish – I remember in the 60s – TPG Motors, they sold and serviced motor bikes, also Mr and Mrs Nurse had a grocers shop all now under the EDF (Seeboard) yard. Opposite our house was a small tobacconist shop, run by a small Jewish gent whose name eludes me right now, but was taken over by Mr and Mrs Simpson in the late 60s, it was always busy even on Christmas day! Next to that was D.F.Brownes TV shop, then Gibson’s Fish shop and then Colwell’s Florists. Message for Neil – I lived in Coleman Avenue from birth until I married in 1976 and my parents told me the top of Coleman Avenue was not bombed – there were never houses built there. It was wasteland for years apparently. The bomb landed at the top of Woodhouse Road. The Old People’s Home was built on the wasteland that I remember as a child. The Square was indeed ‘Ingram Square’ and I had many friends that lived there, so visited the houses often as I grew up. I really think it is a shame the flats replaced these lovely houses, but can understand why they were demolished. The houses had lovely gardens, taking up precious space where numerous people now live, as opposed to a few in comparison. Noble Court I believe was named after a fighter pilot called Dennis Noble, whose plane was shot down following dog fighting over the area. He was only 20 years old. His plane plummeted 300mph swirling downwards, and crashed just about where Portland Gate adjoins Woodhouse Road, roughly speaking. Amazingly his skeletal remains, plane and jacket were found thanks to a historian in 1996 (details and pictures are all in the local Argus). Dennis then had a second funeral (first one in the early 1940’s) so he can now rest in peace with dignity that only a hero deserves. Born at 111 Ingram Cres. 1940. Wonderful community to grow up in. As children we all knew that the ‘hump’ on the wasteland at top of Coleman Ave. contained the body of the unfortunate pilot, it was common knowledge. Have many memories of that area/era. My grandparents lived at 99 Ingram Crescent. My grandmother had an aviary in the garden and participated in local bird shows until she was in her 80s. I was born in Sackville Road in 1957 and lived in this area on and off until I was an adult. I lived in Arthur Street opposite the Channel Laundries. All the children used to play between the loading bays. The corner of Arthur Street was where I had my first ever kiss and Stoneham Park was where I had my first cigarette. Smoking a thing of my past and the boy of my first kiss long forgotten. When we moved to Arthur Street when I was 5, we had no bathroom and an outside loo. Not quite the ‘des res’ they are now. Does anyone have any information about the site on which Ingram Crescent was built? Was it an ancient holy site? Thank you. My mother lived at 94, Ingram Crescent in the 1920s and 1930s. She attended West Hove School in Portland Road. I have several photos of her taken in class groups. When the family first moved to Ingram Crescent there was only gas lighting, she remembers having electricity put in. It was only put in downstairs though as they had to pay for each light but they couldn’t afford to have the bedrooms lit with electric light. My mother is still alive and is now 92 but she still has very fond memories of growing up in Hove. She left in 1940. The Granada Cinema in Portland Road, after standing boarded up for several years, has now been demolished. The end came about a month ago (May 2012): there is now no trace except a pile of rubble. Hi Barbara, I wonder if your mother would remember my father, Wilfred Van Heddeghem. He had two sisters Winifred and Joan and they lived at 99 Ingram Crescent. My grandmother had an aviary in the back garden. My father, Leslie Phillips and his best friend Jack Lynn (my Godfather), lived in Ingram Cresent in the late 1920s/ 1930s. Sadly my father died in 1989, but I wonder of anyone knew remembers them? Alan, did you live in St. Leonards Avenue? Wendy, yes I did, until the age of 10, in 1959, I lived at number 9. When I moved out my maternal Grandmother (Kate Smith) moved in until her death in 1983. Hi Alan, I lived at Number 3, upstairs flat on the corner. My name then was Van Heddeghem. Do you remember the Ramseys who lived in the top flat on the opposite corner, their daughter’s name was Ann? Also the Wrights, bottom flat across the road – Jean and Pat? I’m sure you remember the sweet shop on the corner of Errol Road. When I was about 3 my mum popped out for something and left me alone (how times have changed!). I locked the door and couldn’t open it again. I remember the nice man who owned the shop (maybe you can remember his name) bringing a ladder and climbing in my parents’ bedroom window to open the door for my mum. Lots more memories of that time – we lived there until 1963, then moved up to Deacons Drive. The owner of the corner shop was Mr Limburgh – my memory isn’t as bad as I thought! 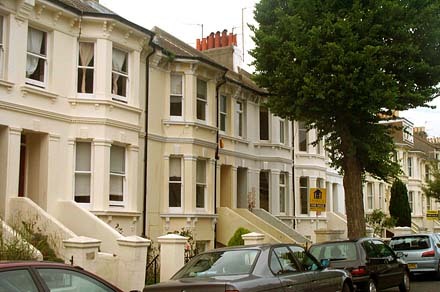 Hi I lived in St.Leonards Road all of my childhood years and the house was haunted by monks! I heard rumours that the building (and ones either side) was built on the site of an earlier ecclesiastical building. Does anyone know of the early medieval history of Aldrington? Hi there, I’m a trainee journalist for Journalist Works and I’m currently writing for submission to The Argus. I have recently been assigned as a community reporter for your area and I was wondering if there were any issues or events you would care to share with me? If so, please do send me an email. Regarding the debate between Neil Tideswell and Michele Gross and the bombing of Portland Gate, I believe it was bombed, although not seriously damaged during WWII. I have a photo of the building, with slight damage and soldiers doing some repairs. I understand this is separate to the Hurricane pilot, Dennis Noble, who crashed Aug 30th 1940 very close by in Woodhouse Road. Alan, regarding Jack Lynn, he is my mother-in-law’s cousin, closer than it sounds as two brothers married two sisters. He and his wife Maisie are still well and attend family gatherings. I assume you are not in touch so will remember you to him. Jack’s cousins Brenda and Joyce Lynn lived at 33 Ingram Crescent and later at no 22. I am trying to gather recollections of the area for Joyce’s 80th birthday- any names, nearby shops or other major or minor events from 1933 to 1956 would be of interest. Joyce trained as a nurse from about 1949 and worked at the old Ear, Nose & Throat Hospital. Chris Pellet, many thanks for your offer of mentioning my name to Jack Lynn but I do get to visit him and “Auntie” Maisie from time-to-time, the last time being over the Christmas period. “Uncle” Jack was very good to my dad when he was ill and going to Horsham now and again to see him is the least I can do. Prior to becoming my Godfather he was my father’s best man in 1946. Hi, does anyone remember a little shop just off Coleridge Street - it was on Westbourne Street called Normans I think. I remember it from childhood days spending pocket money in there. Managed to find the name of the shop: Chapman’s run by Martyn Chapman. Hi, I was born in Poets Corner in 1965 in Mortimer Rd. There were numerous shops in the Corner: Chapman’s grocery store, Crawshaw’s pies, Banks Corner sweet store – the list is endless. Do you know of any events or things going on in this area? I have just moved here. The long established off licence in Richardson Road has a planning application to change it to a Micro-Pub. Look up Lion Mews Tavern or Richardson Road to locate the local talk about it. Date for decision 4th April 2014. Is this a good thing or not? The off licence has barely changed for over 85 years. Sorry but we have had to delete your post. We are no longer allowing the posting of requests to find third parties, as sharing information like this breaches their privacy. We recommend you try Friends Reunited website if you want to track old friends or neighbours. Hello, I used to work in the nursery on Portland Road called young Sussex. I know this building used to be a school, but I wondered if anybody else had more history to the building or surrounding area. A few children have said spooky things and it will be interesting to hear what used to be there (I do understand that children can come out with strange things and it’s most probably just imagination) but I’m open minded and a two year old asking me why there was a man standing next to me with no head got me thinking, ha ha! The nursery school building was built as a school sometime between 1891 and 1896. Before that, it was a field! However, almost directly north, where Holmes Avenue meets Old Shoreham Road, there was a gibbet sited on the path there leading to Acacia Avenue. The people hung on the gibbet didn’t lose their heads, as such, but they certainly lost the use of them. The field in which the school stands was part of Aldrington Farm, once Aldrington Manor. The Gibbet became the name of a farm within Aldrington, yet the farmhouse was on the north side of Elm Drive where it meets Maple Gardens. There was a pond there, even in the 1920s, which was a fine place to visit on a day trip from central Hove on a cart. The land belonging to Gibbet Farm (or Barn) belonged to the owners of Hangleton Manor. Ingram Crescent was built in a field which, at the time of the Tithe Apportionment of 1840, was called Pond Piece. The pond shows up on the 1783 Yeakell and Gardener map, but was gone by 1840, presumably flattened during the building of the railway line. There is no evidence it was a holy site. Part of Aldrington (among MANY other places) was granted to the Priory of St Pancras at Lewes, but it is doubtful any of the monks ever set foot on much of enormous tracts of land they owned. They would just get the income from the land. St Leonard’s Road was built on fields mostly belonging to Red House Farm, although they originally belonged to Aldrington Manor. There is no evidence of any earlier ecclesiastical buildings in Aldrington than St Leonard’s Church. Any Saxon church which may have existed prior to the Norman Conquest, was probably made of wood and would now lie either under the sea or the harbour. However, few know that Aldrington was the home of an anchorite, a religious hermit, called Rev William Bolles, who had himself bricked up within St Leonard’s and had to rely on the goodwill and generosity of passers-by for his food and sustenance. Difficult, because even in 1403, Aldrington was all but deserted, having lost 40 acres to the sea, and most of the houses a century previously. The course of the River Adur has changed considerably over the centuries. At Shoreham, it was far wider, for example, and included much of what is now the airport and the salt farms and flowed out to sea there. Sediment built up, making the river narrower and forming a delta. Over the centuries, the longshore drift has pummelled the shores with shingle, dragging it eastwards, then out to sea again, then further eastwards, all along the coast. Over thousands of years, this has happened several times, so that sometimes, sediment would pile up on top of the shingle, creating land which could be farmed, or built on. (When the foundations for the King Alfred were dug, 30 feet of shingle had to be removed first. Ancient Brighton lies just to the west of the Palace Pier, again, under 30 feet of shingle.) Back and forth, this shingle and sediment has created land, and destroyed land. Eventually, nearer our own time, a bar formed which ran eastwards along the coast from Shoreham, blocking the entrance to the harbour and changing the course of the river, until its outlet was approximately at the site of Hove Lagoon. This bar used to be part of the parish of Lancing, but it is now divided among the various parishes. In the 1920s, Hove Lagoon was just an ugly swamp until it was decided to create a water-based play area in its place. The Victorians did a great deal to fight the power of the sea. They built groynes to help to divert the shingle all along the coast. To stop the sea battering the cliffs, as it had done for centuries, they concreted over it, from the King Alfred to Kemptown, creating roads, gardens and walkways in the process. The River Adur didn’t continue past the Lagoon. Eastwards, the Domesday towns of Aldrington and Hove were sited on what is now the beach, under that same 30 feet of shingle. Hove lost 150 acres and Aldrington lost 40 acres between 1291 and 1340, the dates of two tax returns, from which land losses can be computed. There was a stream in Hove which flowed or trickled out to the sea. In the 17th century. It was referred to as the Hove Ditch, and formed the boundary between Hove and Aldrington. It is remembered today in Westbourne Place, Gardens, Villas and Street. That boundary dictated the extent of the back gardens of Westbourne Street, Westbourne Place and, eastwards, of Leighton Road. The boundary stone still exists on Kingsway, between the modern block of flats called Fairlawns, in Hove, and the older Westbourne Terrace just to the west. There are other visible signs of the boundary dotted about. I came across this site quite by accident and have thoroughly enjoyed reading the posts. I was born in “Southlands Hospital” in 1954 and spent the first seventeen years of my life in Poets Corner. My Mum and Dad lived there all their married life (Suffolk Street). I have loads of memories of the area which have been brought to life again this evening. Thank you! Hi Pat – if you would like to help out by sharing some of your memories with us-please contact me and I can show you how you can start. Hope to hear from you. My ancestor, Samuel Ashburner Foot, lived at Silverlea, Portland Villas, in 1901. Does this house still exist or is it known as something else now? Thanks. Hello Julie. Four doors away from “Silverlea” in the 1911 Census is “Cavendish”, which is still there on the west side, near the Portland Road end of Portland Villas, and numbered 46. I would imagine that the site of “Silverlea” was between “Cavendish” and the junction with Portland Road. Since the houses there look similar to “Cavendish”, I would suspect that the house called “Silverlea” is still there. Kellys directory 1914 has a Mrs Billamore at Silverlea which is on the west side. Portland Villas only has #1/2 numbered but it looks as if Silverlea would be #15. Thanks, Alan and Geoffrey, I have just now looked back at the site and read your comment about Silverlea. I will have a trip down to see if I can spot it.